Description: In the ongoing debate over the when and how our universe began, Genesis chooses to answer the theological question, "Who set in motion the beginning of the heavens and the earth?" Once that question is answered by vivid and memorable stories, the focus moves to ancestral stories that identify the roots and early branches of the Jewish family tree. This same tree grows in Christian settings as the matriarchs and patriarchs of Genesis appear over and again in New Testament writings. Given the growing interest in family genealogies, in this commentary Joan Cook leads us to appreciate and delight in our ancient and awesome spiritual heritage as well. We should not be surprised, however, to discover that our earliest spiritual kith and kin were guilty of deceit, marital infidelity, jealousy, and murder. But readers will learn that the God who created the heavens and the earth is also a forgiving and protective God�the God of ancient time, of our time, of all time. 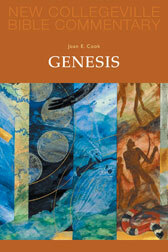 Citation: Jonathan L. Huddleston, review of Joan E. Cook, Genesis, Review of Biblical Literature [http://www.bookreviews.org] (2014).